Four months before Sweden surrender Livonia, Estonia and Karelia to the Russian Empire the building of the farm Källagården is completed by farmer Nels Månsson. 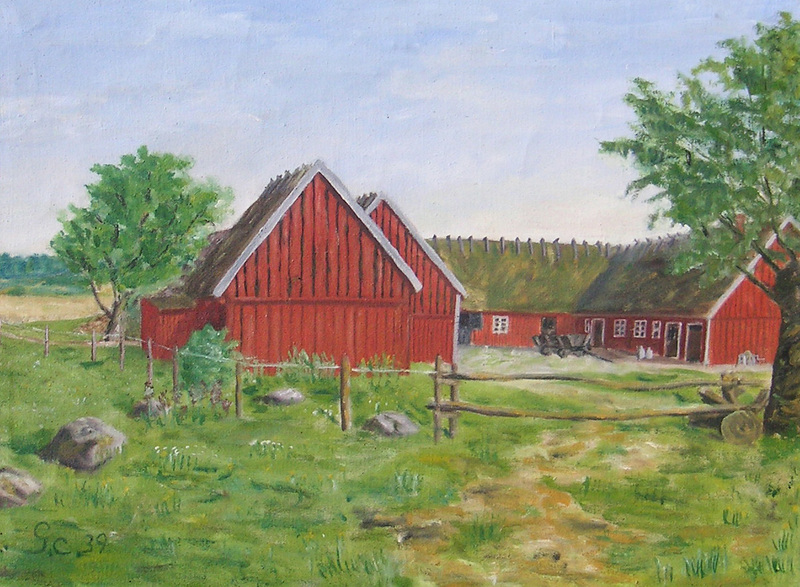 On April 30th in 1721 the story of the half-timbered farm begins, even though it would take more than two centuries before it was named Källagården (in English: the Spring farm). 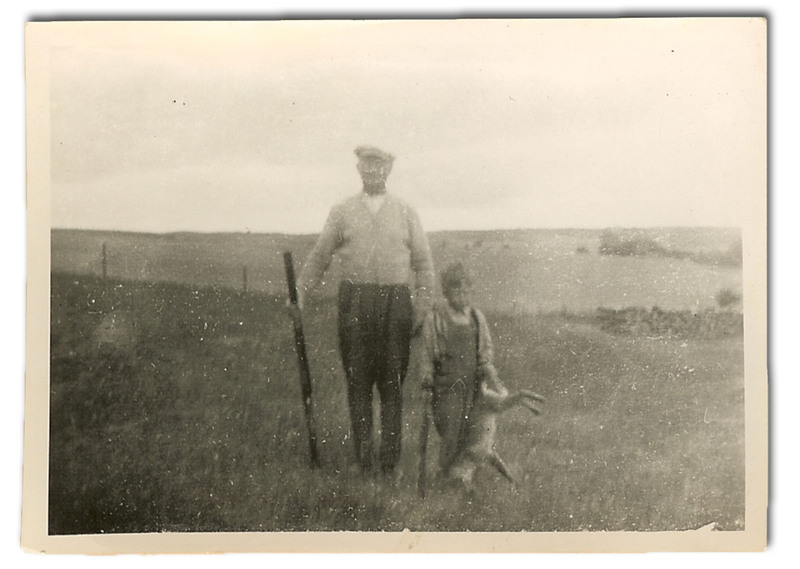 In 1949 today’s owner’s parents, Yngve and Greta Andersson, thought that was the natural choice since water springs surrounds the farm and also supported the village with fresh water through a pipe since 1920. The spring water was used to irrigate the orchards of apples and pears, and still is. 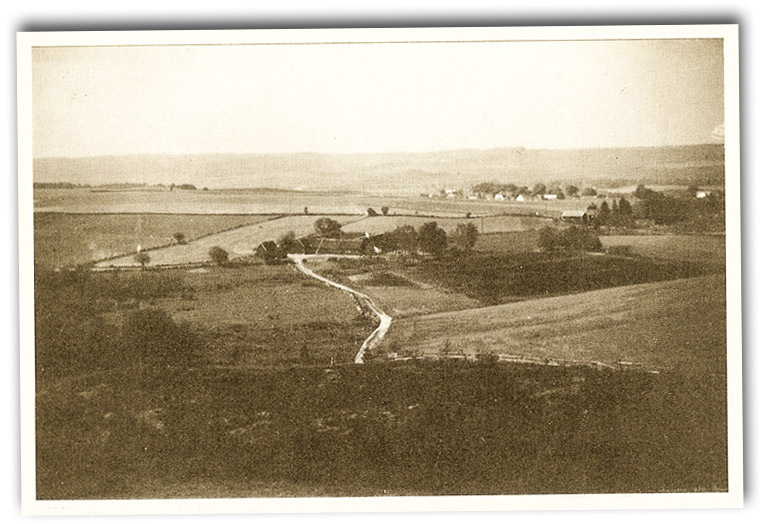 The farm was originally erected next to Brösarps Gästgiveri (the village inn) in the center of the small village, but was moved to its current location during Great Partition in the mid 19th century. Nels Månsson’s wooden sign from 1721. 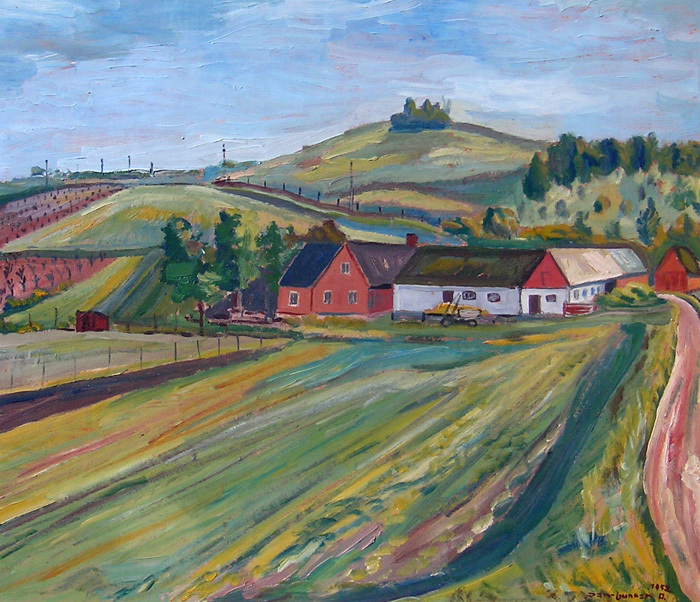 Oil painting of Källagården from 1939, by initial G.C., a relative to the former owners Emil and Hilma Nilsson. 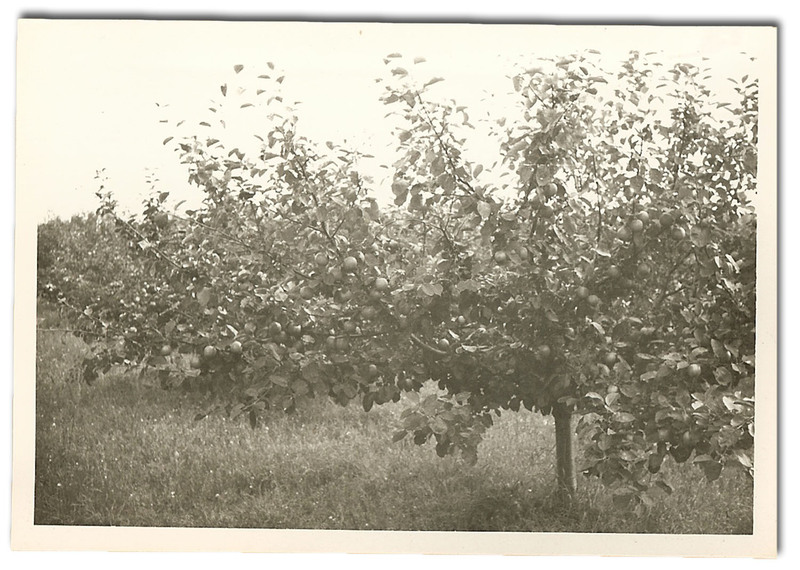 The first apple trees were planted in 1949 on 12 acres of land. The apple varieties then were Astrakhan, Cox Orange, Cox Pomona, Ribstone, Boskop and James Grieve. Also pear was planted; Greve Moltke, Herzogin Elsa, Esperenseherre and Göteborgs Diamant, and several varieties of plum; Victoria, Green and Yellow Greengage, Hackman, Jeffersson and Mörrabeller. The plantations were a result of the shortage of vegetables and fruit during the World War II, and this shortage made the farms that could produce profitable and prosperous. We had to wait about six to eight years for the first good harvest. 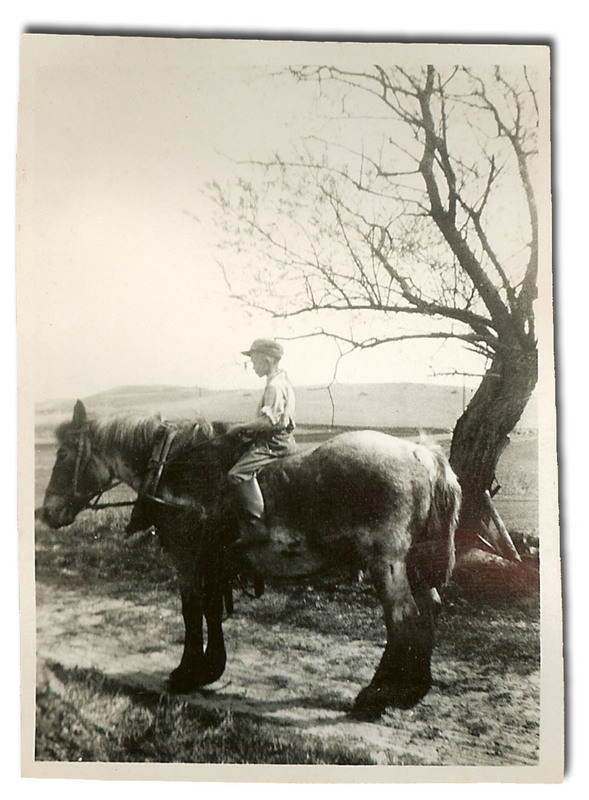 In those days it was common to plant about 240 trees per hectare, which can be compared with today’s 2 000–3 000 treees per hectare. Later on, in the mid 1950s, there was a general overproduction. 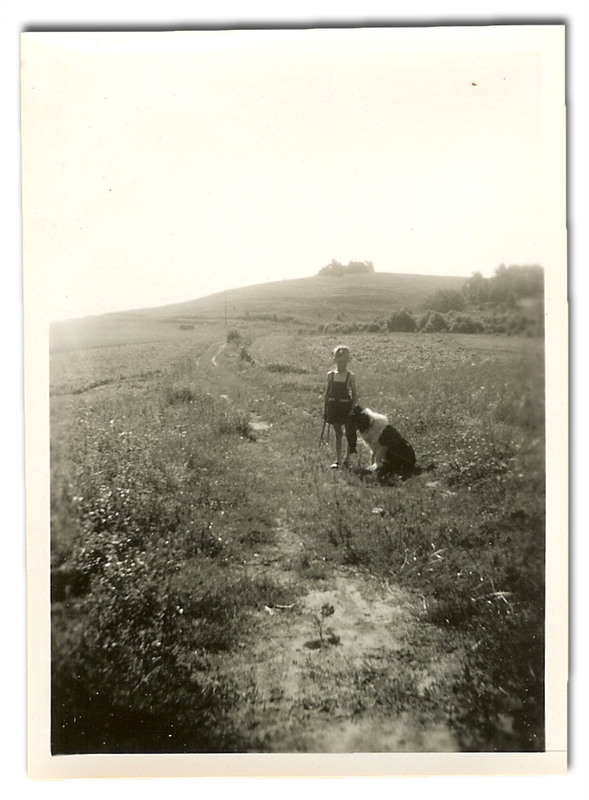 While waiting for the first good harvests at Källagården we were pretty much self-reliant with our cows, pigs, chicken, geese, turkeys, traditional crops, raspberries and green beans that we sold to the famous Bong tin can industries in Ystad. The trees grew and gave higher yields each year. We harvested, stored, packed and finally sold the fruit to grocery stores around Skåne. Slowly the fruit took over the animal husbandry as the orchards grew in size. By the mid 1970s we produced 350 tons of fruit per year. In 1978 we chosed to consentrate on the cultivation only and stopped our own packaging and distribution. At the same time we planted more and more black currants, to about 24 hectares, and eventually harvested over 100 tonnes per year. It was big step from the original single hectare we planetd in 1961. The market for black currants has unfortunatly been very unprofitable since the 1990s and after a pending period we have now phased out the black currants. The fruit orchards, specifically the apple orchards, have changed a lot, trhough acquisition of land, clearing old orchards and re-planting with slow growing tree, shorter spacing and modern irrigation. An oil painting of Källagården from 1952 by Jörgens brother Jan-Gunnar Andersson. 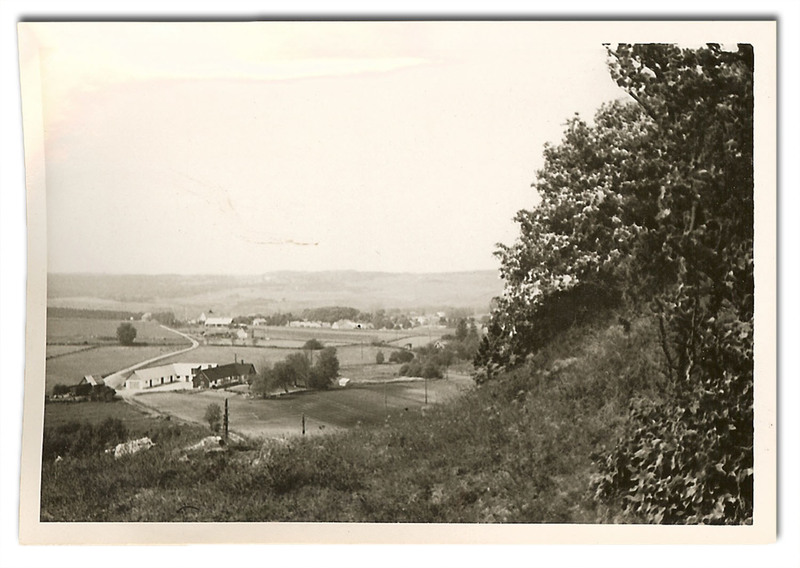 In the background is the ski slope Ornahög. As we quit our own packagingm, storing and distribution it was a natural choice to join the apple growers’ cooperative Äppelriket. The coopertive offered modern storing fascilities and packaging possibilities. Today the orchards occupy 23 hectares of apples, 1 hectare of pears. 2 hectares of plums and 1 hectare of cherries. Our apple varieties are Aroma, Ingrig-Marie, Frida, Mutsu, Discovery, Summerred, and the old varieties Gravensteiner, Signe Tillisch, Katja, Kim and Gloster. Our pear varieties today are Pierre Corneille, Charneu, Conferense och Alexander Lucas. The plums are of the late ripening Monark variety and the new Jubileum. The Riders farm in Nangijala during the filming of the Brothers Lionheart. Also worth mentioning about Källagården are the land disputes we had with the Tomelilla Municipality in the 1970s. Tomelilla Municipality intended to buy big parts of the orchards and the forests to build motel, camping village, golf course, fotball pitches, plastic skislope, etc. 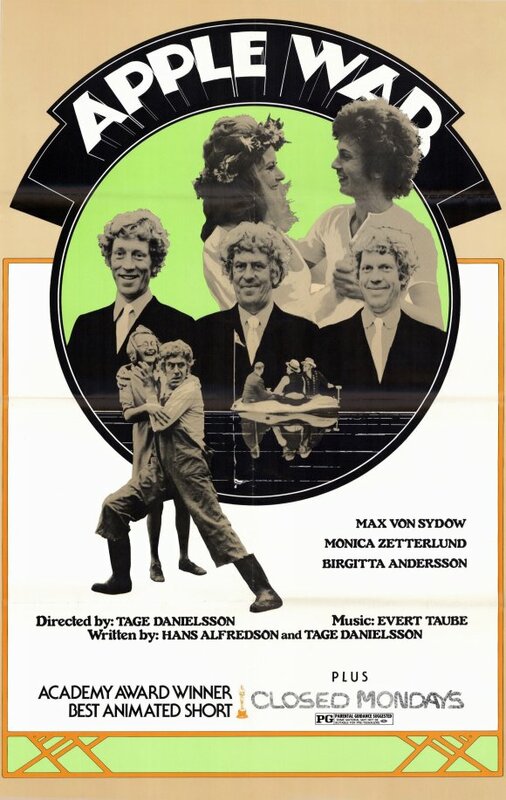 Those wild plans gave the famous comedians and film makers Hasse Alfredsson and Tage Danielsson the idea for “Deutchneland” and the movie The Apple War, that was filmed in the area. 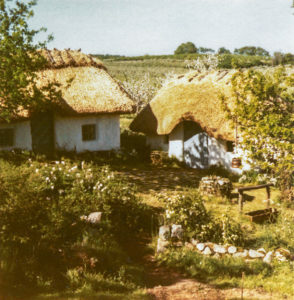 When the world–renowned writer Astrid Lingdgren had her book “The Brothers Lionhart” filmed, they picked the far end of Källagården’s apple orchards as location for Nangijala’s Cherry Valley. The film crew erected the Riders farm in the eastern part of the Källaården orchards, next to the rolling hills of Brösarps backar. Big old cherry trees surround the location but since they are not in constant bloom school children from Brösarp tied thousands of fake flowers to the apple trees during the months of filming. You may see the exact location on this map. The Borthers Lionheart at the Riders farm, where the blacksmith of Brösarp had made door mountings to give the houses an authentic impression. 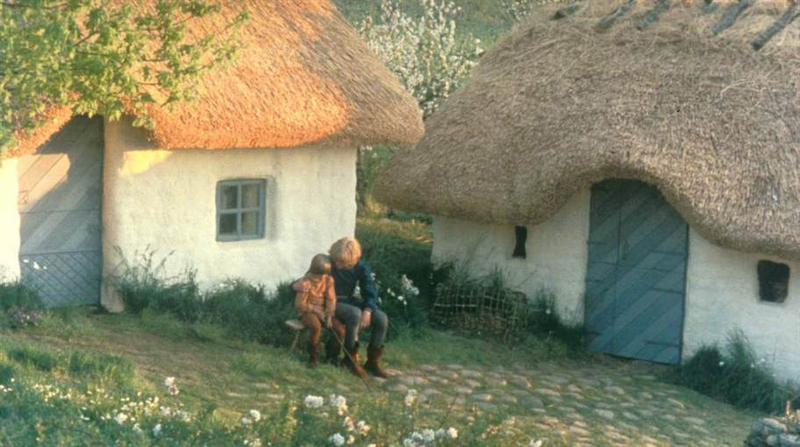 Astrid Lindgren togehter with Rusky (Lars Söderdahl) and Jonatan (Staffan Götestam) in front of the Riders farm during the filming of the Brothers Lionheart in Brösarp, May 24th 1976. Källagården’s previous owner, Emil Nilsson, together with today’s owner, Jörgen, in 1949–50. View over the farm from the bronze age grave Ornahög. Källagården in 1937, when the farm was still enclosed with four houses in a square. Photo taken from Ornahög. Jörgen with the dog Lizzi, and the bronze age grave Ornahögen in the background. Today’s owner of Källagården, Jörgen, on the horse Skimlan. 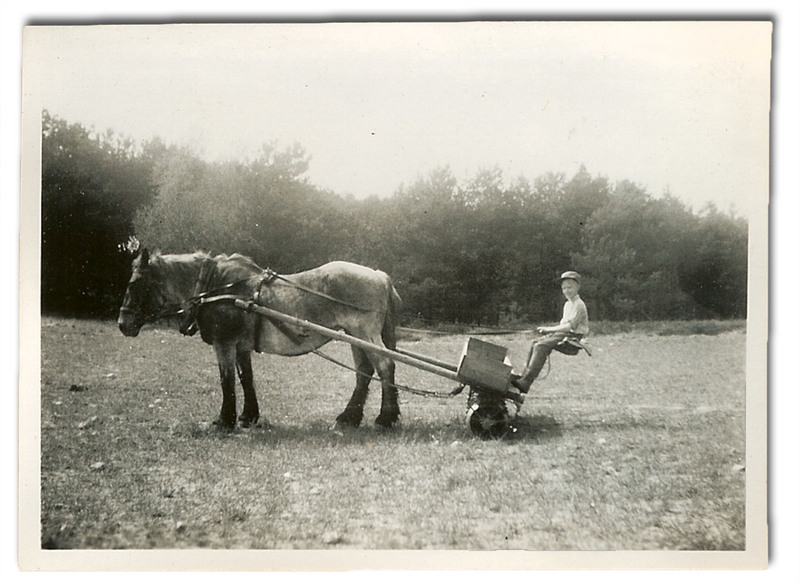 Jörgen and Skimlan rolling the land. The movie ”The Apple War” is based on a true story, where Källagården’s land was involved. 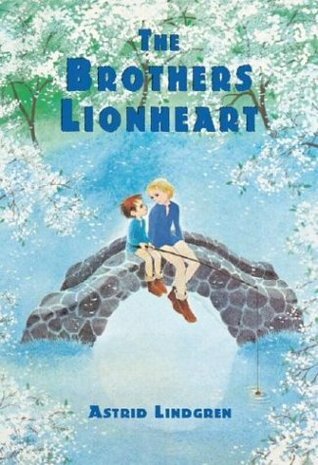 The Brothers Lionheart orginal book cover.